Now it’s not often you see news articles specifically about astrochemistry, though the cynic in me suspects that the only things that catch the eye of reporters are words like “prebiotic”. Not that I can really complain, seeing as that’s what got me interested in the first place. But I digress… Folks using the Robert C. Byrd Green Bank Telescope have discovered a whole bunch of new interstellar chemicals. Pretty funky chemicals too, like cyclopropenone and methyl triacetylene. Interesting, because they’re potential building blocks for PAHs and other things. They’ve found ten new molecules in the past 3 years, which may not sound like a lot, but it’s a record number for such a short time. These guys are good. Based on their success, they’re planning on widening their search to see what they might find. I could’ve guessed where they were looking. (Well… actually I did.) The Sagittarius B2 Complex. A hulking array of molecular clouds near the core of the Milky Way, several parsecs in diameter. Sgr B2, as it’s known, is a kind of benchmark for interstellar molecules. Every chemical discovered in space has also been found in Sgr B2. 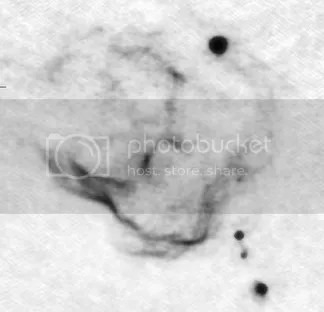 The image here is of Sgr B2 North, one of the three main dense molecular cores in the complex. The question of how Sgr B2 became so rich in chemistry may be something to do with it’s proximity to the galactic core. Sagittarius A*, the real heart of the galaxy, is a supermassive black hole. 3.7 million solar masses compressed into a space under 45AU in radius. There’s no direct proof that it’s actually a black hole, but that much mass would collapse under it’s own gravity in such a small space, anyway. Sgr A* is the vast mass that holds the entire galaxy in it’s grip. Nearby to it are supernova remnants; the corpses of stars that ventured too close and were literally torn to pieces by gravitational stresses. If stars are attracted then it stands to reason that molecules would be too.